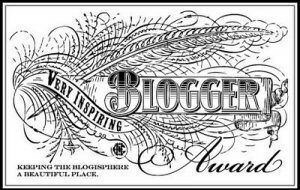 Its been quite some time since I received a blog award so it was such a nice surprise to find out that I had been given one by the lovely Marianne Wheelaghan who definitely has an inspiring blog so you should check it out. Thank you for this lovely award! The rules of this award is to list 7 facts about yourself which I'll start by doing now..
1. I don't collect anything any more but as a child I collected all sorts... shaped soaps and miniature perfume bottles, stamps, postcards and the one I wish I continued with is patterned paper bags. I could have now used those for my papercrafts or to create envelopes for my letters. I couldn't get far with it though because shops only seem to use plain brown paper bags these days. 2. I would really love to wear nail polish all the time with all the fancy patterns. I've always owned some bottles of nail polish but my nails just don't take to it and they feel so odd which results in me taking it off straight away. In the summer holidays I picked a bright red bottle up and applied it to my toes, it hadn't yet dried before I took it off. In reality though all products were out of date as I've had them since I got married. 3. My dream lately is to stay at home and complete all the projects that I'd love to do in paper crafts as I have so many ideas but its just sitting down and actually doing it. Its a shame there is no income in it but maybe one day! 4. I'm finding the older I get the more attracted I'm becoming to cutesy teen stuff. When does the time come that you need to realise you're too old for it? 5. I've realised that I keep buying my niece toys that I often wanted as a child or liked the idea of having. She loves them but doesn't get to play with them enough with me having put them away until we have time to play with them together. She looks after things to start with but on the days she feels lonely with my mum or bored you'll find her things all over. Its a good job houses are small here with not so many rooms as I often think I would love a playroom in my house with most things in. I often picture it in my mind. I'm insane I know. 6. I keep thinking when I get a house my husband and I will have a movie night. I hardly watch TV and films even less but often I feel like I'm missing out on a whole other world. I realised how much I miss it when I went with my niece to the cinema and noticed it was the most content I've felt in a long time. 7. With the way life has been for such a long time now (even before I got married), I find myself a couple of times a year checking horoscopes in case one of them tells me something I really want to read and it may be true. I would love to have my tarot cards read just for curiosity but I wouldn't even know where to go about doing that. The idea is that I pass this on to 15 people but I know a lot of people feel overwhelmed by these awards so I will just say if you want to do this go ahead and blog about it, then let me know and I'll come by as I'm always curious about the person behind the blog. PS, I agree, finding 15 others is BIG ask and definitely intimidating! I'm glad you enjoyed reading a bit more about me. I actually keep thinking I might join something like lovefilms or netflix for us to enjoy once a week. It will be a bit like books where I'll watch anything and I may end up being able to review those too. First though I need to get a house. I've just read a couple of blogs in the past where the owner of it has got a lot of awards and they are struggling to find things to come up with about themselves to share as they are personal blogs so they actually request not to get awards. I enjoy them though as they give me something to do :). Congrats for getting this award! I'm not trying to flatter you but, you totally deserve it! :D I love your posts, especially on your life and book reviews.